MyHome, the New York City based design and remodeling firm, has completed a transformative kitchen and bathroom renovation at 253 West 16th Street in Manhattan. Park’s team was challenged to make both spaces feel wider and more functional without any actual walls coming down. 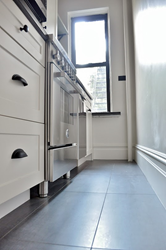 MyHome, the New York City based design and remodeling firm, has completed a transformative kitchen and bathroom renovation at 253 West 16th Street in Manhattan. The project was lead by Ji Sun Park. MyHome faced a major spacial challenge in this kitchen remodeling project. The client initially wanted to open up a wall in the extremely narrow kitchen, but after a year of back and forth with building and city officials, she eventually had to let go of the idea. Therefore, Park’s team was challenged to make both spaces feel wider and more functional without any actual walls coming down. To address this challenge, Park infused the kitchen with simple lines through the use of shaker style cabinets, a neutral monochromatic color scheme, and warm lighting. Slim line appliances were used, including a 24” wide x 24” deep gas range, a 24” wide x 24” deep refrigerator, and an 18” wide dishwasher. Traditional accessories were paired with antiques owned by the client to create a depth of design across the space. Furniture pieces from the client were also used to create open shelving in the kitchen. Gray subway tile was used as a backsplash and, to add a unique element, was paired with black grout. In the bathroom, one challenge of the original space was that the tub took up a majority of the narrow room. To address this, Park replaced the tub with a standing shower. Walls were specifically built to prevent water splashing while the shower is in use. Similar to the kitchen, white subway tile was paired with dark gray grout for contrast. Additional touches to the overall space were open shelving in the seating area to accommodate the client’s large book collection. MyHome was founded in 2001 by managing partner Yoel Piotraut. The company, which is based in New York City, has a team of fifteen consultants, designers, and managers. MyHome’s New York City kitchen and bath showroom is located at 353 West 48th Street in Manhattan. Ji Sun Park has been working with MyHome since 2012.